After watching ‘Venom’ I could only think back to the hit horror film ‘I Know What You Did Last Summer’. Upon further research, the director of ‘Venom’ Jim Gillespe actually made ‘I Know What You Did Last Summer’. In addition, Kevin Williamson was a producer of the film. Williamson wrote all the ‘Scream’ films. So there are tons of nuances from those franchise of films that are put into ‘Venom’ which comes across as a mix between the two franchises that is set in a cajun Louisiana swamp type setting. If you enjoyed ‘Scream’ and or ‘I Know What You Did Last Summer’ then you will definitely enjoy this thrill ride. Despite all of its over the top sequences, it is actually a fun film. So basically starts off with a woman digging up a briefcase for which we don’t know what the contents of. This woman gets in her car and heads off with the briefcase in her car. From here we meet a group of friends hanging out and talking about usual life when a couple of the get into an argument near a bridge. Cut to a tow truck driver driving on the bridge and the old woman with the briefcase driving near the bridge at the same moment with the kids talking in the same location. Everyone tries to avoid the accident, but a crash ensues and the old woman’s car falls off the bridge. The tow truck driver saves the old woman but since he is a stand up kind of guy he goes down to the bottom of the bridge where there is a lake of water and he retrieves the old woman’s suitcase. The suitcase opens and we see that tons of snakes are in the suitcase and the snakes attack the tow truck driver and he is killed. His body goes missing for a bit, but is recovered and taken to the morgue. This is where the movie takes off. The tow truck driver comes back to life and goes on an insane killing rampage after that group of friends from the beginning of the film. They figure out that the old woman is involved with voodoo and they try to learn how to stop the undead truck driver. From here on, it is a more or less trying to stop the tow truck driver and not really succeeding, due to the stupidity of the stereo typical dumb characters. It is overall a fun film, but ultimately falls flat. ‘Venom’ has been letterboxed at 1.78:1 and the Disc contains an AVC 1080p HD transfer, but the original film was 2.35:1. This distorts the picture in a way that shows a layer of grain and punctuates blemishes. The whole film looks to be zoomed in more than it should be. However, it is a mostly clear image with blacks and shadows that pop. The colors show up fairly vibrant considering it is a darker tone of a film. ‘Venom’ carries a DTS-HD Master Audio 5.1 track that is pretty decent. The dialogue is crystal clear and the full set of speakers get a workout especially in the swam sequences. You can hear everything buzzing around. I actually looked around my house at a couple of moments thinking there were actual bugs or people in the room. And the bass kicks in every time someone is attacked. – Cast Auditions – This seven minute feature shows several of the main cast members auditioning for their roles. I always love seeing audition tapes and seeing and feeling what the directors and producers felt when they cast their picks. – Voodoo Nightmare: The Making of ‘Venom’ – A very brief nine minute mini featurette that shows the cast and crew talking about how the film was made and what it was like making the film. Brief and in my opinion too short. – Storyboard to Film Comparisons – This seven minute mini featurette shows side by side on screen comparisons of the storyboard artwork and the final film for a few scenes. Not all that interesting unless you are interested in storyboarding. 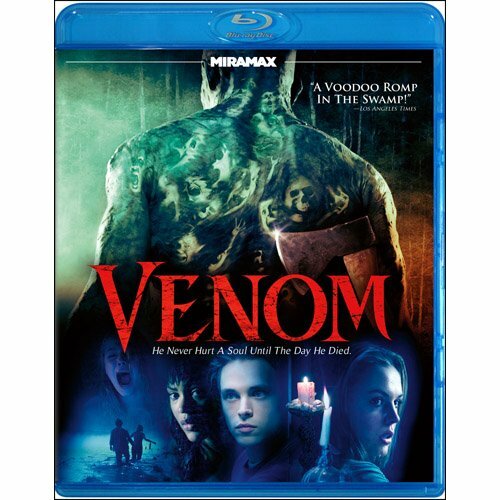 ‘Venom’ is a fun film to watch with friends in a movie marathon that might include ‘I Know What You Did Last Summer’, ‘Otis’, and ‘Hatchet’. The film falls flat here and there, but there are some cool death scenes and ultimately is a bit of bloody pleasure. I was surprised that they changed the aspect ration on the video, but not really noticeable. I would have preferred for longer extras or more extras, but maybe on a future re-release. Overall ‘Venom’ is fun, thrilling, and funny. Purchase the film directly from Echo Bridge HERE!!! or purchase from Amazon below!! This entry was posted on Sunday, August 21st, 2011 at 2:44 pm	and is filed under Film, News. You can follow any responses to this entry through the RSS 2.0 feed. You can skip to the end and leave a response. Pinging is currently not allowed. « Geek Deal of the Day!!! Tron & Tron Legacy Blu-Ray 5 Disc Set!!! 50% Off!! !